In 2017, wind energy grew faster in New Mexico than in any other state. Now, the Land of Enchantment has 17 wind projects, 1,005 total turbines, and at least seven additional projects either under development or under construction. The state currently produces enough wind energy to power more than 420,000 homes. Besides industry growth, New Mexico also exemplifies what wind energy can do for rural economic development and opportunity. 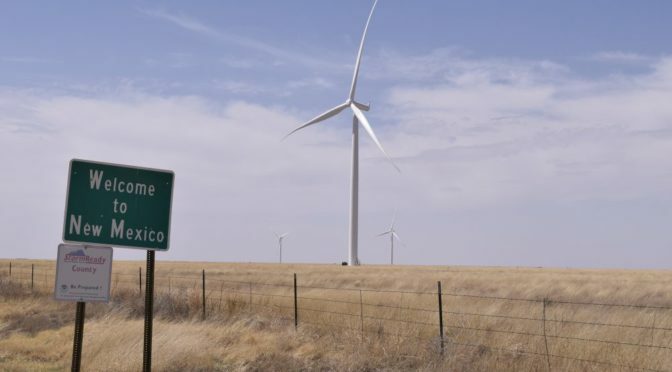 Halfway between Albuquerque, N.M., and Amarillo, Texas on Route 66, the rural community of Tucumcari, N.M. is making its mark on the wind industry. The small city of just 5,000 residents is home to Mesalands Community College and its Wind Energy Technology Program. The college hosts one of the only wind technician programs in the country with an actual turbine on campus – a huge advantage for students to gain hands-on experience. Andy Swapp, the Program Director for the Wind Energy Technology Program at Mesalands, has a long, inspiring history of engaging students with renewable energy. After retiring from the U.S. Army in 1996, Andy Swapp became a high school physics and engineering teacher northwest of New Mexico in Milford, Utah. Residents of Milford had long accepted the nearly constant wind as an everyday inconvenience. Andy felt differently about the windy town. He describes having a “light-bulb moment” one day after plowing his land. He noticed the wind pick up dirt and strip the paint right off his barn. The wind was powerful, and he wanted to do something with it. Andy began taking his students out to map nearby wind currents, teaching them complex math and physics equations with real-world applications. The students, nicknamed the Wind Kids, calculated wind strength and velocity all across their hometown. A prospector in the area heard about what Andy and the Wind Kids were doing and connected them to a wind project developer on the east coast. A few years later, Andy’s student’s project turned into a 306 megawatt wind farm – the largest in Utah to date. Many of Andy’s students from Milford High School went on to work at the wind farm or study engineering. Andy knows that those students can take pride in their careers. They had a hand in bringing clean, renewable, wind energy to Milford, which came with a significant economic boost. With wind projects rapidly developing across the country, Andy began to wonder about what kinds of wind training programs were out there for students looking to enter the industry. While still working as a high school teacher in Milford, Andy came across plans for the Wind Energy Technology Program at Mesalands Community College in Tucumcari, N.M. In 2006, the college made plans to build a LEED-certified building adjacent to the wind turbine. Andy thought it would be impossible, but a few years later, with $2 million in federal grants and enthusiastic community support, the college succeeded and accepted their inaugural class. The 1.5 MW GE wind turbine came online in 2008 and has been running ever since. Three years ago, Mesalands needed another Wind Energy Technology Instructor, and Andy took the job. Over those three years, the number of students going through the training program doubled, in line with the number of wind turbines in the New Mexico. According to the Bureau of Labor Statistics, wind turbine technician is the second fastest growing job in the country, only behind solar installer. Many graduates of the Wind Energy Technology Program quickly find well-paying jobs close to home. There are currently 43 degree-seeking students. When they graduate, they will be highly employable. They can stay close to home, earn family-sustaining wages, and play a role in strengthening their own communities. American Wind Week in Tucumcari, N.M.
As part of American Wind Week (August 5-11), AWEA is hosting a special event on Friday, August 10 at Mesalands Community College to celebrate and come together as wind power supporters. This will be a full day of events, including a training workshop, community open house, facility tour, and reception. RSVP for the training workshop and open house.